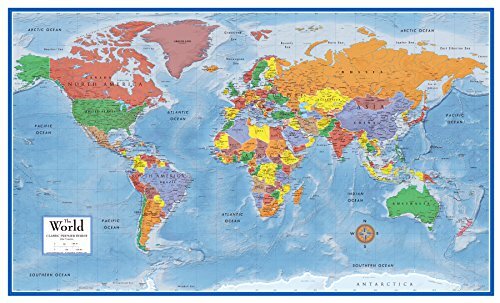 24x36 World Classic Premier Wall Map: This elegant, richly colored Classic Premier Series world map features the incredible cartographic detail that Swiftmaps has become popular for. This is our #1 Selling 24x36 World map poster. This updated map has current political boundaries and features a Miller Projection, which reduces distortion of land masses as they near the poles. The amazing 3D ocean and land topographic shading will turn heads as something few have ever seen. This is the newest technology in World Mapping and Swiftmaps is happy to be leading the way in North America! This map edition printed on 24lb poster paper and UV coated with a 2 sided liquid lamination that is specially made for use with dry-erase markers. Only the best from Swiftmaps line of quality wall maps!! Durable 3mil Lamination - perfect for dry-erase! Hot new large world map design with 3D Ocean Shading!